RICHMOND, VA - The Richmond Flying Squirrels, Double-A affiliate of the 2012 World Series Champion San Francisco Giants, are asking their fans to step forward and help the Oklahoma Tornado Relief Efforts on Sunday, June 2nd at The Diamond. The Squirrels will have a Better Box mobile storage unit in front of the main gate for items to be donated and shipped to a relief distribution center in Oklahoma. The items needed are specific and are listed below. The storage unit is scheduled to be ready outside of the main gate beginning at 11:00AM and will remain there throughout the Squirrels game vs. the Erie SeaWolves. Gates for the game open at 12:30PM with first pitch scheduled for 2:05PM. Fans who donate items to the effort will receive a raffle ticket to win one of several prizes. Winners will be drawn during the game. "We want to do all we can to help out not only our community but people in general," said Flying Squirrels Vice President and COO Todd "Parney" Parnell. "We are delighted to help in this endeavor as we can only begin to see from the pictures the magnitude of the devastation. 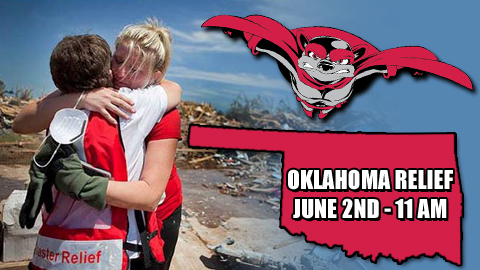 We encourage Squirrels fans from all over the region to help us help Oklahoma." Items Needed; canned food, Band-Aids, Q-Tips, thermometers, dental floss, toothbrushes, toothpaste, sports drinks and bottled water, baby blankets, shoes of all sizes, medical ointments and creams, feminine hygiene products, razors, travel hand sanitizer, anti-bacterial wipes, empty plastic containers, snack size chips, underwear and socks, Ziploc bags, senior supplies (hearing aid batteries, denture cream Depends), glasses (reading and prescription), shampoo and soap, work gloves, and tarps. The items will be shipped to Journey Church in Norman, Oklahoma. The church has been set up as a shelter, distribution and relief center. Hopewell Baptist Church in New Kent is helping coordinate the efforts. Limited tickets for the upcoming homestand are available by contacting the box office at (804) 359-FUNN (3866) or on-line at SquirrelsBaseball.com. Single-game tickets and Mini-Plan packages are currently available and can be purchased by calling the Flying Squirrels at (804) 359-FUNN (3866), logging on to SquirrelsBaseball.com or visiting the Squirrels Ticket Office at The Diamond.